The Organisation of American States (OAS) is to hold a special meeting on 22 July to hear Colombia's complaint that Venezuela tolerates Colombian rebel camps on its territory. Colombia says it has strong evidence that Venezuela is providing a safe haven for left-wing guerrillas. Venezuela strongly denies the charge. It has accused Colombia's President, Alvaro Uribe, of trying to provoke a diplomatic crisis before he leaves office next month. "Colombia has the right to denounce in front of the international community the presence of guerrillas in Venezuela", Colombian Interior Minister Fabio Valencia said. The Colombian government said on Thursday it had proof that five rebel leaders were sheltering across the border in Venezuela and planning attacks from there. It said it had the exact grid co-ordinates of camps of both the Revolutionary Armed Forces of Colombia (Farc) and the smaller National Liberation Army (ELN). Colombian officials are preparing a dossier of video and other evidence to present to the OAS. Venezuela has angrily rejected the accusations, and recalled its ambassador from Bogota for consultations. Venezuelan Foreign Minister Nicolas Maduro said the accusation was an attempt by Colombia's outgoing president to undermine attempts to improve ties after President-elect Juan Manuel Santos takes office next month. Mr Santos has said he wants to repair relations with Venezuelan President Hugo Chavez. But Mr Chavez now says he will not attend Mr Santos's inauguration, and has threatened break off all diplomatic relations. "This is your first test, Mr Santos. 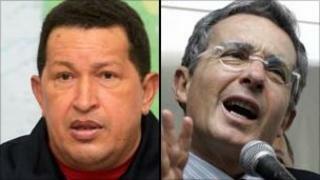 Let us see if you distance yourself from Uribe's aggression against Venezuela", Mr Chavez said on Friday. Bilateral relations, already strained, took a turn for the worse last year when Colombia agreed to let US forces use Colombian military bases. Mr Chavez said the move was a possible step towards a US invasion of Venezuela and he ended trade with Colombia. Two years ago, Venezuela and Ecuador suspended diplomatic ties with Colombia after Colombian forces attacked a Farc camp in Ecuador, killing a senior rebel leader. Colombia has regularly accused the left-wing Mr Chavez of supporting the Farc. Any ruling from the OAS is unlikely to influence Mr Chavez, who has condemned the organisation as a puppet of the US. In March he described the OAS as "like a corpse that must be buried" and advocated its replacement by a new regional body that excluded North America.